This whole work week was crazy busy. With two providers out all of a sudden, needing to call to cancel & reschedule patients, on top of doing daily work, checking people in and out, taking phone calls, and just having to do damage control as the majority of people we needed to reschedule were angry. Some people still showed up for their appointments because either they did not listen to their voicemail or didn’t get a voicemail for some reason (voicemail not set up, no voicemail, or an invalid phone number). I’m also in charge of our Corporate Accounts which is a big deal for us and that was one of the most difficult situations to deal with because we want to keep their business but at least two wanted to speak to upper management. I was glad that they asked to speak to my manager because we were able to come up with a back up plan which the two representatives seemed to find acceptable. However it does not take away from the fact that we failed to meet their expectations. It’s better for someone to voice their displeasure so that we can find a solution than for them to remain silent and not renew their contract. The Provider most of these people needed to see had to serve on jury duty for an estimated 1 1/2 weeks and unfortunately she cannot be cloned. So if she’s out, then unfortunately, there is no one to take her place. Jury duty is not an option however everyone was so angry and who did they take it out on and who had to deal with it? Me. A few days this week I had to work alone, management thought it shouldn’t be a problem as our department had 0-3 providers in the office depending on the day. Sure, if all I needed to do was check people in and out, I can handle being alone. But when I’m doing that for our department and other departments on our floor, plus taking phone calls (which we had many due to the cancellations of appointments), answering multiple emails, trying to reschedule all of the cancelled appointments, and all the other paperwork & things I need to do, I was stressed! By Friday (yesterday), I was dragging. I just wanted to lay down on the cold, dirty floor and fall asleep. The majority of the time, I have difficulty falling asleep but yesterday it wouldn’t have been a problem. We also had a meeting that I wasn’t aware of and when they passed out the agenda, I saw my name on it where I needed to speak about one of our Corporate Accounts. I wasn’t sure what they specifically wanted me to talk about nor the extent of the information they wanted me to divulge. I hesitated at first and then apologized for not having anything prepared. Before I could say anything else, my direct manager started to talk about the issues we were going through in the past week. After she was done, I added more now that I knew exactly what they wanted me to talk about. But it didn’t make sense why one account was mentioned but not all the others. It doesn’t even matter anymore. Our top boss (I don’t know her title) was at the meeting as well. I felt really dumb and hope that she doesn’t think that I don’t know anything about the Corporate Accounts (this is my favorite part of my job and I want to keep doing it, especially if it expands and another position needs to be opened). I also became really paranoid and then stressed out about losing my job. I don’t even know why my mind went there. I’m so glad that it is Saturday and I can take a break from the chaos. I had at least 2-3 people make comments on my appearance. One guy told me I had put on weight but I looked better because I was too thin before. Then I had someone really irritate me (I was probably more irritated because I was trying to get as much done as quickly as possible and because of the type of week that I had). I’ll call her Nancy. Nancy will come in 1-2 hours before her doctor is even in the clinic to try to “catch him” before he gets into his office. In the meantime she likes to sit and talk to me because she thinks I’m not doing anything “important” because I’m not helping a physical human being. But I really don’t have time to listen to her talk about the same thing for one hour or more. And the story that she tells me never changed from the last five times or more that she’s told me her feelings on this particular subject. It’s something that can be said in five minutes but she goes around, and around, and around (like I am- ha ha) and either restating it in other words or just using the same words. She doesn’t care. At first I did talk to her but after a while there is just no time for that. Not even time for the guy that likes to tell us stupid jokes (the same jokes) that he made up and he’ll hang around forever unless someone needs our help. I fake laugh but it’s so much effort to do that. And he’ll laugh as well for a long time as he stares at me (or us if there is someone next to me). It’s very uncomfortable. Anyway, back to Nancy. She came over to our counter and told me that when I had passed her, she didn’t recognize me because I had cut my hair and “boy did you beef up!” She just kept going on and on about it. “Wow! Your face really went… (she cupped both of her hands on her cheeks and made a “pfffffff” sound, filling her cheeks with air so that it would appear larger, and moving her hands in opposite directions to indicate that I just got really huge). She couldn’t stop laughing about it. I guess it amused her. I kept typing out the email that I needed to send off as soon as possible and all I would say after every two comments or so was, “Mmhuh” (without opening my mouth) and, “Yep” (more like, “YePuh”)- with an emphasis on the P. She eventually went away, still laughing. Nancy reminded me that people judge outward appearances (especially weight gain or the infamous “Prednisone Moon Face”) without knowing anything. People usually keep their comments to themselves, which is the polite thing to do. She’s assuming that I just started eating everything in sight. Being laughed at because I “beefed up” after everything that I’ve been through and still not being “in the clear,” really pissed me off. It also didn’t help that my co-worker told me the other day that when I gave her a ride home after work, her husband told her that he didn’t recognize me at first and thought I was a guy. Yep. I’m a man now. And not a “beefcake.” Just a chunky monkey. I recalled a memory of the first time I was having a huge Lupus flare and was put on a high dosage of Prednisone for a long time. Back then I had gained even more weight. I had a celebration (I don’t want to get into the details) that was supposed to be a special day for me. Two of our guests came up to me (I didn’t know them well- they were my friend’s aunties). “Wow, you really got fat, yeah?” They knew that I had Lupus so I told them that I had been really sick and was getting better but was still on Prednisone. “I know,” I said sadly, “It’s because of the medicine that I have to take.” They both started to laugh hysterically, “Yeah, right!” I walked away as they were still laughing and grabbed the first friend that I could find. 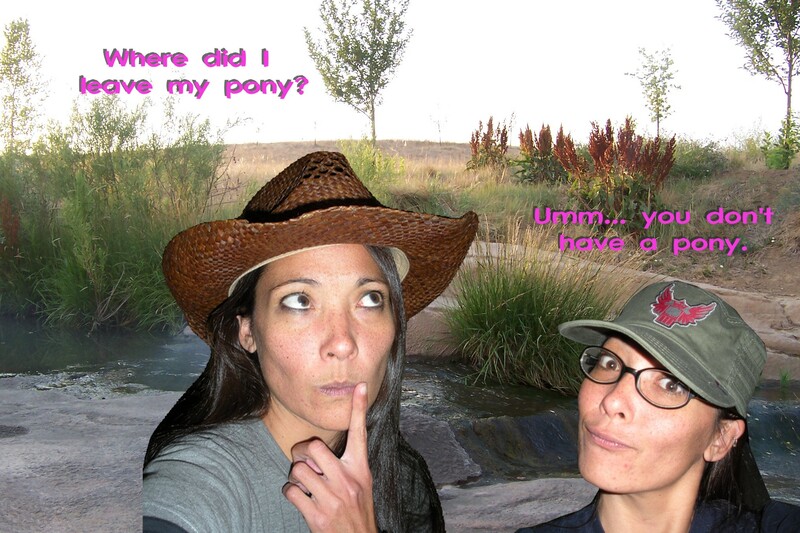 I found Lei. I asked her if she would come with me to the parking lot, away from everyone so I could smoke a cigarette. I held back the tears until we weren’t surrounded by anyone else. I don’t know why I was so sensitive about it that night. I’m bored. Actually I’m tired and can’t seem to do anything but sit here thinking about how bored I am. I went outside for a little while and of course it starts to drizzle (only to stop when I go back inside the house to seek shelter). 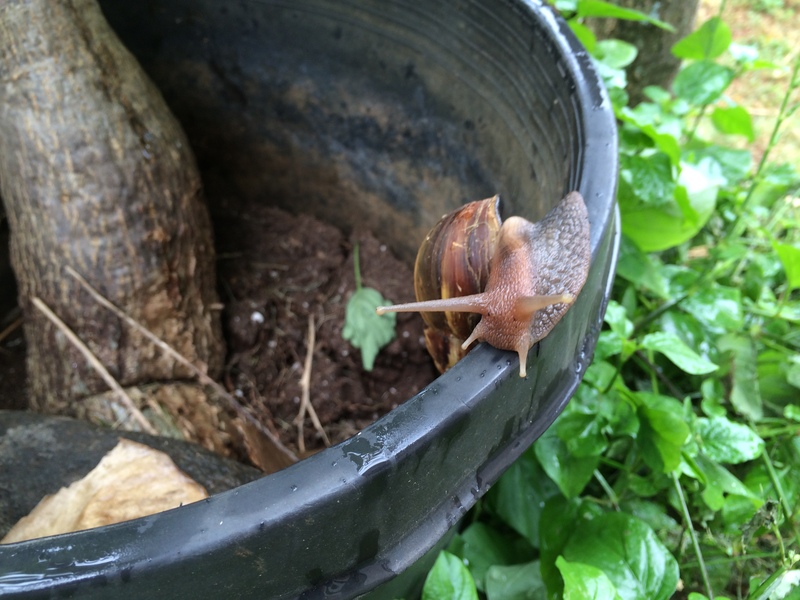 Creatures… creepy, crawly, slimy creatures abound here. When I first moved home certain facts that I should have been prepared for were almost like new discoveries for me since I had been gone for so long. I remembered the sunny days filled with laughter spent at the beach; gorgeous rainbows that painted the sky that was gloomy just a few moments before; and long hikes to the top of the mountain or to a waterfall. 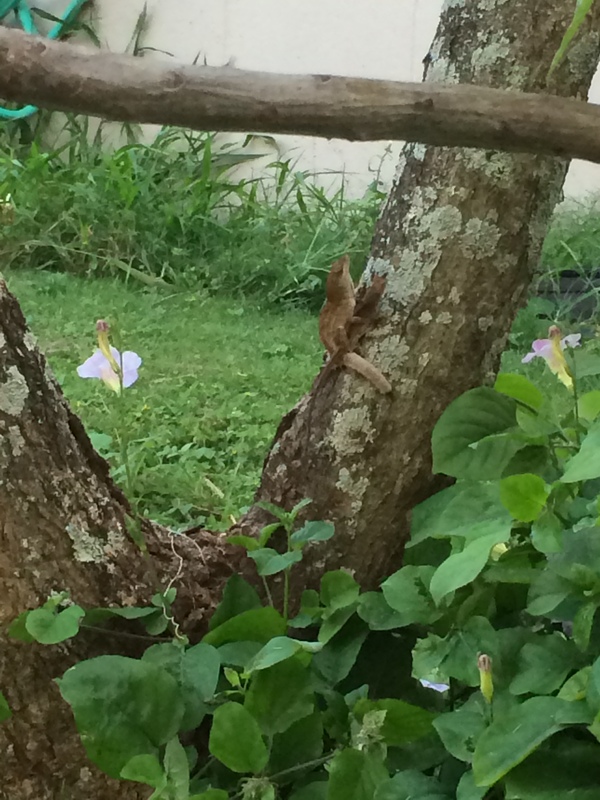 I forgot about the mosquitos and “mosquito punks;” demon toads that wanted to touch my feet or jump and grab onto my ankles; flying roaches (which thank goodness I haven’t seen yet); geckos; snails; centipedes; spider webs; and of course spiders (especially Cane Spiders). I made the lizard angry. 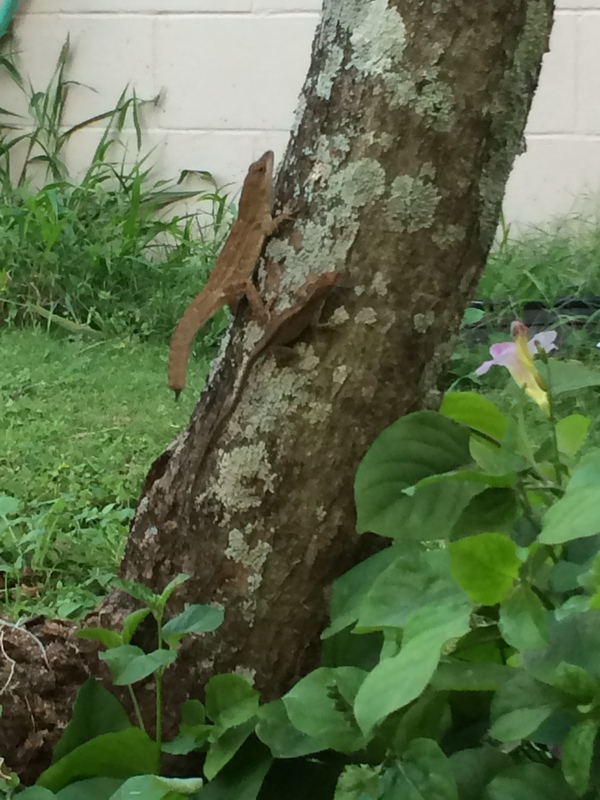 I’ve noticed many “mutant” lizards recently so it must be “Lizard Season” or at least maybe mating season. 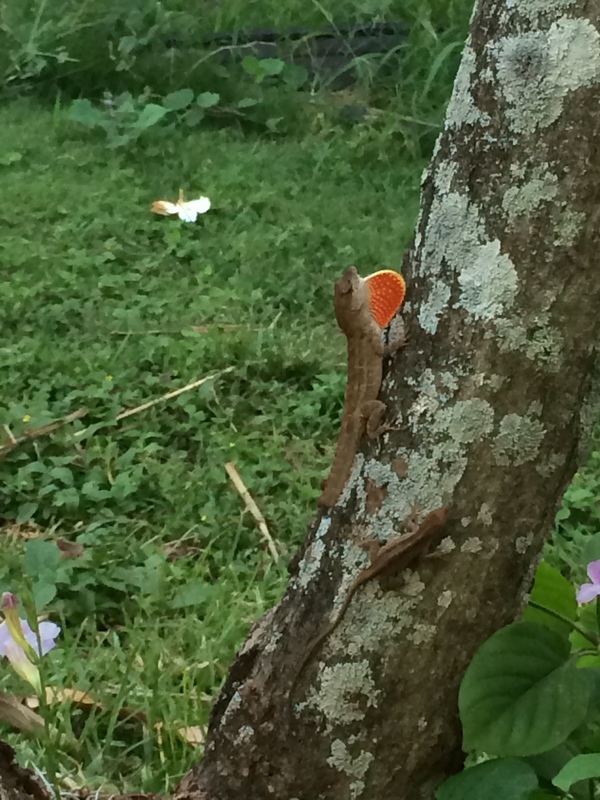 I saw that same “Alpha Male” lizard yesterday when I went outside, I recognized him by that unique and ugly tail of his that looks like it’s growing back after having lost it. So the only proper thing to do was to name him. I told my mom that I named him Igor (pronounced “eye-gore”). My mom kept correcting me that the pronunciation was “e-gore” (long e). I told her I was the one that named the lizard and it’s “eye-gore.”‘ She knows better than to play argue with me because she knows most of the things that I say are nonsense anyway and don’t matter. 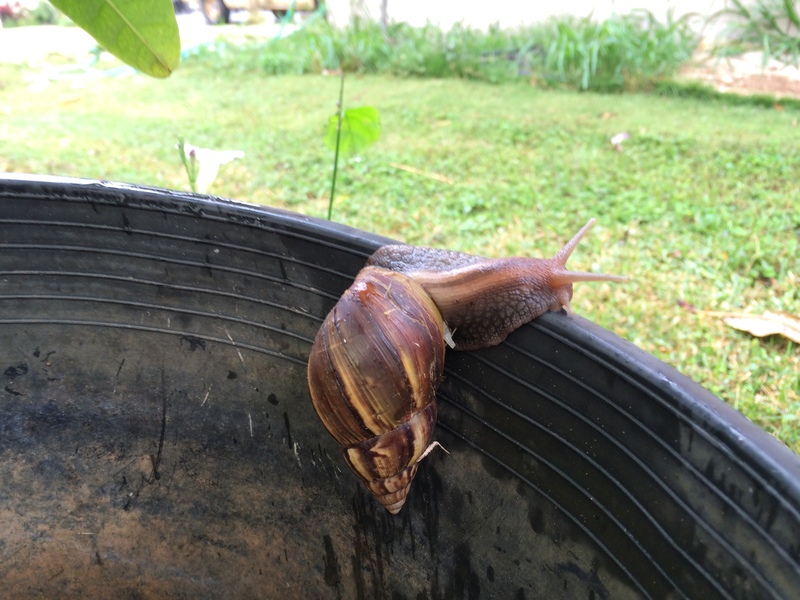 Today while I was outside in the drizzling pre-rain, I saw a giant snail. Well it looked like a medium sized snail. Again, I had to photograph it. Garden creatures abound everywhere. They surround me. They force me to use my flash light when I leave the house at night to eliminate the possibility of us having any physical contact whatsoever. I find a safe place to sit outside and look up into the night sky filled with stars and planets. It’s quite peaceful until it’s time to go back into the house and I have to turn my flashlight settings back on my phone so I can return “safely” indoors. When I first moved back home it wasn’t long before I was covered by mosquito bites. I could go outside for a minute or two and come back covered with 5-7 bites. I said it was because I was like “fresh blood” since I was on the mainland for so long. I recently noticed that I haven’t been getting bites for a while so either: 1) It’s not “Mosquito Season” yet; or 2) They don’t like my meds.